This Motorcycle tour in North Vietnam covers all the famous attractions in Northern mountain areas also the untouched lands in remote areas near Chinese border. 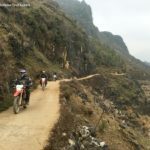 This 15 day motorcycle tour in Northern Vietnam will give you a full view of the hidden beauty and rich tradition of Vietnam, it’s one of our greatest adventure Vietnam motorcycle tours. The short motorbike tour to Mai Chau will be started at around 9 Am from western outskirt of Hanoi . Avoiding the busy traffic by taking some narrow and small country roads. 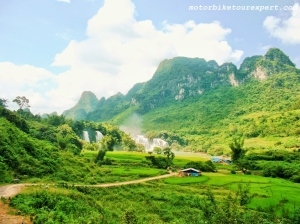 We motorcycle to shout west of Hanoi to Mai Chau – an area of beautiful landscape. After lunch, we will have great motorcycle tour on forgotten French road No 6, passing extensive farming lands comprising a sea of paddy fields split by tree-lined roads punctuated by limestone karst scenery. Here is known as Ha long bay on mountain .we cross Thung Khe – one of the most beautiful mountain passes in north Vietnam then heading down to the mountain valley settlement of Mai Chau. ( Home to the white Thai people who are living in houses on stilts). Diner and overnight in a Home stay. Today we will have easy and relaxing Vietnam motorbike tour to North west mountainous area It offers many stopover for pictures of amazing mountain view. We can start the day with a easy walk around the village or be lazy with a waking up café . After saying goodbye to the Thai people we ride to the direction of Moc Chau. After lunch, turn to the less travelled Road 43 leading to the Da River. After crossing the reservoir of Da river at Van Yen ferry, we ride on a beautiful winding road until Phu Yen where we stay in a guest-house. Keep enjoying north Vietnam motorcycle tour on beautiful Road 37 and then entering mountains heavily populated with Black Thai people, who work on large terraced rice fields. The winding road passes through many Thai villages where we can do some stop to visit peaceful village of the Thai people to understand more about colorful culture of Vietnam. We continue through rolling hills before rising up to the mountain of sugar cane on the cooler Son La plateau. After checking in a hotel in Son La town, we’ll have a short walk to the former Son La Prison and enjoy an interesting visit to learn more about the wartime in Vietnam. Day 4: Son La – Tuan Giao – 140 km. After breakfast, We keep heading up to the west from Son La, the road crosses a series of mountain passes and areas of busy Black Thai activity. Children walk to school,men and women working on the field with plenty of buffaloes on the field and the road. Then we come to the beginning of the very long and steep Pha Din pass- one of the most beautiful passes in North Vietnam where at the top we have vast views of the surrounding mountains, then down the other side on very steep sealed road. Today’s road is quite bumpy and narrow, but it’s beautiful with green mountain view at the level of 1500 meters above the sea. And the beauty of nature here is different from the days before. Besides, plenty of terrace rice fields between hill tribe’s villages. We can see a lot of green tea fields. 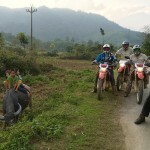 In short, it is a great motorbike tour in north Vietnam although the roads are not so smooth. Arrive Than Uyen at about 5 PM. Diner and overnight in hotel. Day 6: Short Motorbike Tour to Sa pa. 100 km. This short motorcycle tour to Sa Pa should be the highlight of the trip. The first half of the trip, we will enjoy an easy motorbike ride on the smooth road with beautiful tea fields along the way and the colorful hill tribes. And the other half, we ride on Qui Ho pass to cross Hoang Lien mountain range- the highest one in Vietnam including Fanxipan with the height of 3142 meters above sea level. Its sure that you will have pictures of the most beautiful valley in north Vietnam. We will be at Sa Pa at noon. After luch in Sa Pa town, we have half day to discover lovely town in cloud – Sa Pa.
Day 7: Relaxing in Sa Pa.
Sa Pa is lovely little town located at the height of 1600 meters above the sea, surrounded by amazing valley with the villages of minorities, we can either take it easy in Sa Pa town, or take another SaPa motorbike tour along Muong Hoa valley-one of the most beautiful valley in northern Vietnam, or down deep into the valley to see more interesting local people. All options are dominated by the crest of the enormous Fansipan mountain range. The entire region is populated by Hmong, Giay, Tay and Dao people. 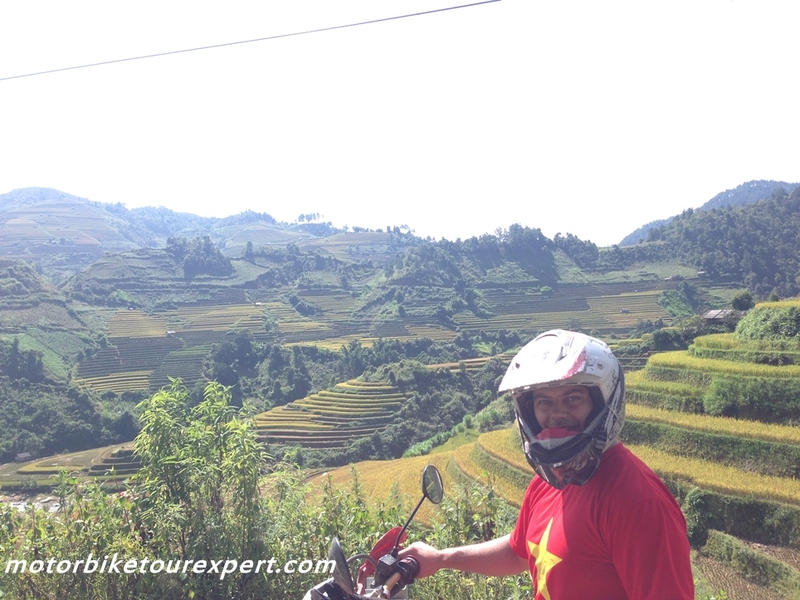 Vietnam Motorbike Tour Expert’s sugguestion is to take a short walk to Ham Rong – a highest peak of the town where you can get full view of Sa Pa or take a short Sapa motorcycle tour along the Muong Hoa valley where you can see the amazing view of rice terrace fields and visiting more H’mong and Zay people. Day 8: Sapa Motorcycle To Bac Ha: 150 km. This motorcycle tour to Bac Ha from Sa Pa is quite easy and enjoyable. We can depart at 10 AM from Sa Pa. Ride motorbike down on winding to Lao Cai. The road is about 40km with very nice terrace fields. Lao Cai is busy provincial capital which has one of the biggest gate to China so when arrived the town, we will stop here for a moment to see around or take a look to China from Vietnam. Lunch could be in the town. Another half day, we will ride up to Bac Ha where we can enjoy plenty of stunning landscape. Arrive and check in Hotel in Bac Ha town at 5. We should start the motorcycle tour to Ha Giang earlier because the road today is quiet and bumpy with picturesque landscape, we can not go fast and have to stop a lot for pictures. We are going to the market of Can Cau located at the heart of a mountainous circus, very close to the Chinese border where the ethnic groups on each side of the border meet every Saturday morning. It is one moment very moving which we have no idea about time. After lunch in Xin Man town, we keep riding on a narrow and winding road but the terrace fields along the way could be the most beautiful in north Vietnam. Arrive in Ha Giang in late afternoon. We can choose to stay in hotel in town or do more home stay with the Tay people. This motorcycle tour to the Dong Van Rock Plateau is another highlight of the trip because of incredibly imposing scenery. In addition, the landscape is completely different from the days before. After getting the permit to ride in border areas at Ha Giang’s Immigration Police, we will enjoy riding on small challenging mountain roads with a amazing view and plenty of colorful hill-tribes. It must be another highlight of this North Vietnam motorcycle tour. Dinner and Stay overnight in hotel. Day 11: Dong Van – Bao Lac – 110 km. Another enjoyable motorbike touring day with a lot of joys ! After breakfast, enjoy easy walk around Dong Van town to feel daily life of the hill tribes at the local market, or enjoy the beauty of ancient architecture of the houses that were built during the French time. Start the best motorbike tour in Ha Giang at about 10 AM. Keep riding on narrow roads along the Rock Plateau, right after Dong Van town we will be on Ma Pi Leng pass( One of 4 longest and most beautiful passes in Vietnam). 20 km on the mountain pass with many picture stop, we will be in Meo Vac town at noon. After lunch in Meo Vac, we go along the Gam river to Bao Lac. Day 12: Bao Lac – Cao Bang. 150 km. Beautiful motorbike ride down to Cao Bang province. The road is easy and there are many beautiful villages along the way, so we can do some stoppage for visiting the local to learn more about minority people’s culture and for photos. We will be at Co Bang in early afternoon. Check in hotel before seeing around the town or being lazy with cool beer ! Day 13: Cao Bang Motorbike Tour to Ban Gioc Waterfall. 140 km. After breakfast, we have beautiful north Vietnam motorbike tour to nice village of Quang Uyen, in the middle of a mountain cirque. This is the territory of Nung An people. Home stay in a host family and the hostess is a great cook. After good lunch with the family, we make our way through spectacular scenery to Vietnam’s most impressive waterfall – Ban Gioc Waterfalls – 50km from Quang Uyen. Weather permitting we can swim right up to where the 50m high falls hit the river. Home stay in Quang Uyen village. Day 14: Ban Gioc – Lang Son. 180 km. The motorcycle tour to Lang Son is mostly on the famous historical Dong Khe and That Khe passes where many battles between the Vietnamese and French occurred. Arrive Lang Son in early afternoon. We will have chance to discover this city which has become a big trading post between China and Vietnam. You can buy cheap Chinese products for souvenirs at the Dong Kinh market. Day 15: Lang Son – Hanoi. 150 km. 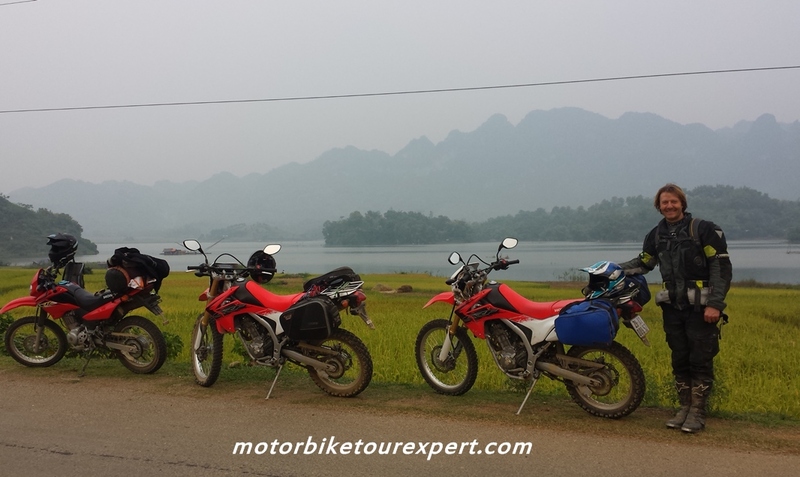 Closing up the Great North Vietnam Motorbike Tour. Today is the most easy day of 15 busy ones but it is an enjoyable day. Waking up late, slowly enjoy good café, and after breakfast motorcycle down to Hanoi on the big high way No 1. We will finish the memorable Northern Vietnam motorcycle tour at around 3 PM.